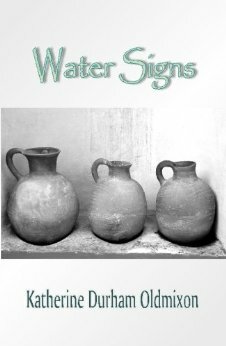 Water Signs (Finishing Line Press, 2009), no. 67 in the New Women’s Voices Series, includes three interlocking sonnet crowns, each situated in the season of a zodiacal water sign: Cancer, Scorpio, Pisces. Kathleen Peirce is author Mercy, winner of the Associated Writing Programs Prize; The Ardors; Divided Touch, Divided Color; and The Oval Hour, which won the Iowa Prize and the William Carlos Williams Award from the Poetry Society of America. She teaches at Texas State University. There lives the dearest structure deep down things–to paraphrase Hopkins. But it’s an underlying truth. We depend on those people who can show us the interconnectedness between objects that are holy and common, between moments that are mundane and mystical. In this exquisite series of interlocking sonnets Katherine Oldmixon acquaints us with a particular grandeur, yes, a freshness, that lies deep down. She is one of those poets that brings clarity to the notion that all things belong together, all secrets, winds, and psalms are part of one whole and rapturous universe. Alan Birkelbach’s volumes of poetry include No Boundaries, Grand Prize Winner of the Pat Stodghill Book Publication Award, and Weighed in the Balances, Grand Prize Winner of the Steves Poetry Manuscript Competition. Katherine Durham Oldmixon has written a gorgeous sonnet sequence, a family history and (even more) a chronicle of the natural world. There is struggle in these sonnets, but also, more strongly, “the blue joy that adumbrates life.” Oldmixon returns dusty poetic symbols to their natural wellsprings, giving seasons and their weather back to the world, refreshed. Susan M. Schultz is a poet, critic, and publisher who lives in Kane`ohe, Hawai`i on the island of O`ahu. She is author of Aleatory Allegories (Salt, 2000), Memory Cards and Adoption Papers (Potes & Poets, 2001), And Then Something Happened (Salt, 2004), and Dementia Blog (Singing Horse, 2008). She edited The Tribe of John: Ashbery and Contemporary Poetry (Alabama, 1995), and wrote A Poetics of Impasse in Modern and Contemporary American Poetry (Alabama, 2005). She edits Tinfish Press and teaches at the University of Hawai`i-Manoa. El Arbol Milagroso – reprinted from the Texas Poetry Calendar 2008 and Big Land, Big Sky, Big Hair: The Best of Texas Poetry Calendar’s First Decade. Katherine is honored to also have poems in issues of Borderlands: Texas Poetry Review; Lifting the Sky: Southwestern Haiku and Haiga (Dos Gatos Press, 2013); Passager (awards issue), REAL, Ellipsis (awards issue), Cactus Heart, Cider Press Review, Sequestrum, and many others.